From the President - Where is the State Bar going? Where is the bar's democracy? Ethics Byte - When it comes to shielding: Holy screen! Statistics tell the story: 13 percent of lawyers in an ABA survey said they drink six or more alcoholic beverages a day. One-third of the lawyers on disciplinary probation in California have a substance abuse monitoring component as part of their probation. More than 18 percent of the attorneys in the state of Washington are dependent on alcohol and as many as 19 percent appear to be clinically depressed. Between 20 and 25 percent of lawyers suffer from stress so severe it impairs their practice. California has never conducted a formal survey of its lawyers drinking habits or stress-related problems, but the amount of burnout and chemical dependence among members of the State Bar is well-known. Dave Dawson, vice president of The Other Bar, a lawyer-to-lawyer program for alcoholics, estimates between 15 and 17 percent of California attorneys are alcoholics. Fran Bassios, head of the bars discipline system, says substance abuse plays a role in 25 to 35 percent of the lawyers who face formal charges. The Lawyers Personal Assistance Program, a free, confidential service for impaired attorneys, receives 200 calls a year. Although most professionals do not believe chemical dependence is more rampant among attorneys than in society at large, they think lawyers face a particular set of obstacles to getting help. In the past, paying State Bar dues might have been both hard on the pocketbook and confusing. Over the past few years, however, bar dues have declined, somewhat easing the financial hit. And this year, bar officials hope the confusion will disappear as well. A concerted effort to make the membership fee statement easy to read and easy to use has resulted in a simpler billing that will be sent to every attorney next month. It will list what each attorney must pay including annual mandatory fees and the amounts requested for voluntary donations to the Conference of Delegates and the Foundation of the State Bar. It also will provide for enrollment in the bars sections. Some lawyers will see charges for late fees, restitution to the Client Security Fund, a fee for failing to complete continuing education requirements or for another of 11 possible categories for which an attorney might owe money to the bar for a reason other than dues. The State Bar this fall honored several distinguished attorneys and judges for their outstanding contributions to the legal profession. 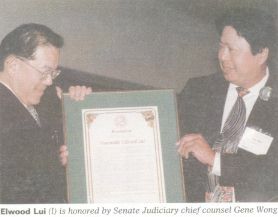 Among the honorees were federal appellate Judge Dorothy Wright Nelson for a career of extraordinary service to the legal profession, retired appellate Justice Elwood Lui for his work as a special master overseeing the bars discipline fund, and some 470 California lawyers who have practiced as specialists for more than 20 years. 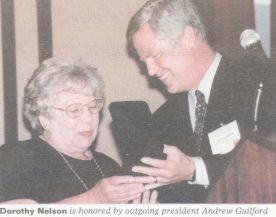 Nelson, 72, was honored at the State Bars annual meeting in San Diego. A colleague and friend of Witkin, Nelson taught at the University of Southern California Law Center from 1957-80 and served as its dean for 11 years. She left the school when she was appointed to the U.S. The U.S. Supreme Court denied two petitions by California lawyers last month seeking review of some continuing education requirements and of reciprocity rules in federal district courts. The justices let stand a decision by the 1st District Court of Appeal in February upholding the State Bars requirement that attorneys complete classes on the elimination of bias and the prevention of substance abuse and emotional distress as part of its minimum continuing legal education (MCLE) program.